The movement from within the tradition cannot be ideological or place itself in the service of any social aims, however morally admirable. One breaks into the canon only by aesthetic strength, / which is constituted primarily of an amalgam: mastery of figurative language, originality, cognitive power, knowledge, exuberance of diction. …The reception of aesthetic power enables us to learn how to talk to ourselves and how to endure ourselves. The true use of Shakespeare or of Cervantes, of Homer or of Dante, of Chaucer or of Rabelais, is to augment one’s own growing inner self. 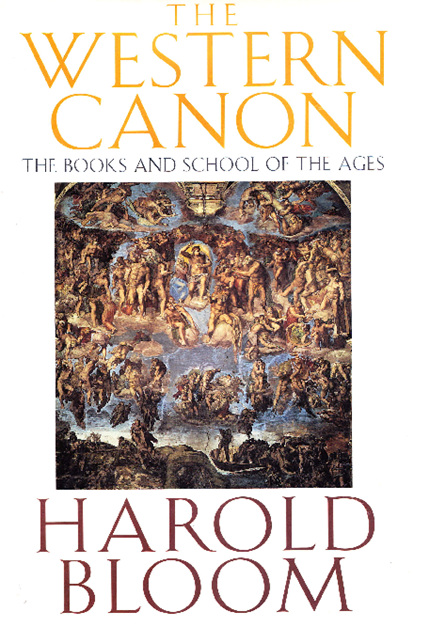 Reading deeply in the Canon will not make one a better or a worse person, a more useful or more harmful citizen. The mind’s dialogue with itself is not primarily a social reality. All that the Western Canon can bring one is the proper use of one’s own solitude, that solitude whose final form is one’s confrontation with one’s own mortality. Confronting greatness as we read is an intimate and expensive process and has never been much in critical vogue. Now, more than ever, it is out of fashion, when the quest for freedom and solitude is being condemned as politically incorrect, selfish, and not appropriate to our anguished society. Greatness in the West’s literature centers upon Shakespeare, who has become the touchstone for all who come before and after him, whether they are dramatists, lyric poets, or storytellers. He had no true precursor in the creation of character, except for Chaucerian hints, and has left no one after him untouched by his ways of representing human nature. His originality was and is so easy to assimilate that we are disarmed by it and unable to see how much it has changed us and goes on changing us. Much of Western literature after Shakespeare is, in varying degree, partly a defense against Shakespeare, who can be so overwhelming an influence as to drown out all who are compelled to be his students. [C]anonical choices of both past and present works have their own interest and charm, for they too are part of the ongoing conceit that is literature. Everyone has, or should have, a desert island list against that day when, fleeing one’s enemies, one is cast ashore, or when one limps away, all warfare done, to pass the rest of one’s time quietly reading. If I could have one book, it would be a complete Shakespeare; if two, that and a Bible. If three? There the complexities begin.